Ford Canada's Mark Buzzell says a new small electric utility vehicle, with an estimated range of 450 kilometres, will be a "ground-up game changer." 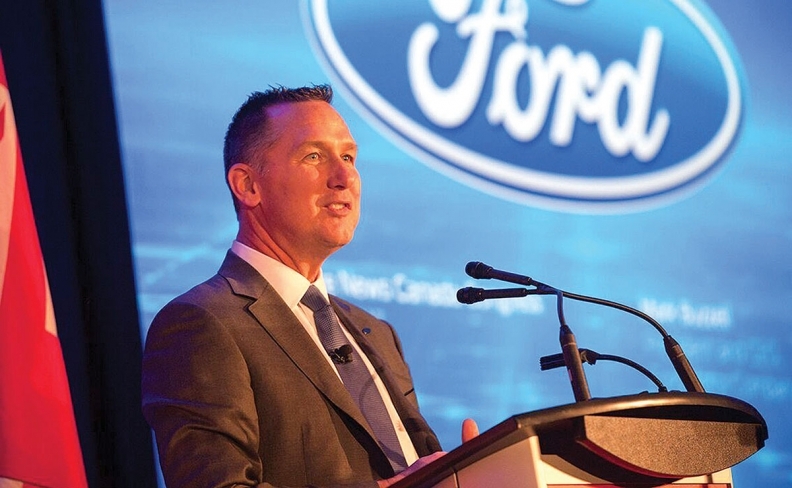 Mark Buzzell will be the first to say that he inherited a solid operation when he succeeded Dianne Craig as president of Ford Canada. But record sales and a fresh four-year deal with the company’s union do not obscure the challenges that will confront Buzzell, 53, who took over in January. Most immediately, Ford and other automakers that do business in Canada must be ready for changes in the upcoming renegotiation of the North American Free Trade Agreement (NAFTA). Buzzell also wants to slow — even if he can’t halt — declining interest in Ford’s conventional sedans and hatchbacks as more Canadians opt for utility vehicles. Longer-term, he will look for ways to grow Ford Canada’s research-and development footprint as the company transitions toward electric power, autonomous vehicles and ride-sharing services. Ford Canada sold 304,618 vehicles in 2016, cracking 300,000 for the first time, largely on the strength of growing utility-vehicle and F series truck sales. It was the top selling automaker in Canada, growing its market share to 16.6 per cent from 14.7 per cent in 2015. Buzzell, previously Ford’s western U.S. general manager, joined the company in 1989. He rose through the company’s marketing, sales and service departments in the United States and abroad, moving 15 times in 27 years. Buzzell, in a wide-ranging interview with Automotive News Canada at the recent Vancouver International Auto Show, said he relishes his new job. While cars show regional strength, there’s no doubt that trucks and utility vehicles dominate the market in Canada. “It’s hard to predict the long-range future but I can tell you that in the short term we’ll continue to see people migrate from cars to SUVs,” Buzzell said. Given that, Ford will continue to look for expansion opportunities in the utility-vehicle segments. The EcoSport subcompact, built in India, will arrive in the first quarter of 2018. Plans call for a front-drive version powered by a 1.0-litre three-cylinder gasoline engine, as well as an all-wheel-drive model with a 2.0-litre four-cylinder. Other markets offer a diesel option. Canada will also get a new Expedition full-size utility vehicle, the first redesign of the vehicle in 10 years. But Ford is not writing off the car market. Buzzell suggested Ford might target more marketing money at models such as Fusion. Ford also wants to work with dealers to create more awareness about electric and plug-in hybrid models. The challenge is to alleviate range anxiety — where drivers are concerned about running out of power — by improving access to charging stations, he said. Ford will ask dealers to install at least two chargers on site and hopes that fleet customers will add chargers at their locations, he said. Ford is spending $5 billion globally to develop battery-electric vehicles and hybrids, Buzzell said, including a new small electric utility vehicle with an estimated range of 450 kilometres. “That’ll be a ground-up game-changer,” he said, stopping short of calling it a Chevrolet Bolt fighter. Manufacturing operations are on a solid footing after Ford Canada inked a new four-year agreement with manufacturing union Unifor in November. The federal and Ontario governments have shown interest in research-and-development work done at Ford’s Windsor, Ont., engine plants, to build Canada’s reputation as a centre for automotive innovation, Buzzell said. “I think the intention is to continue to bring projects here to design and build new engines,” said Buzzell. Ford has relationships with five Canadian universities and wants to use their expertise for projects while providing a venue to train students in areas such as robotics and software development. “That is something that, while we have nothing to announce, we are going to look for opportunities to take advantage of the great intellectual capital we have around Canada,” Buzzell said.